As I’ve mentioned before, I inherited (already back in the 1980s) plenty of 1960s LEGO from my father. However, as my father got them in generic parts packs – at least that is his recollection – and, anyway, they were mixed into one container by the 1980s, I never saw any of original designs. I do remember building some things of them and playing with the small LEGO Town Plan cars (still a wonder to my son in the 2010s), windows and doors, but back in the 1980s I was completely oblivious to the official LEGO Town Plan designs, released a couple of decades earlier. Now, as an AFOL, I have for quite a while wanted to build some of these old designs. 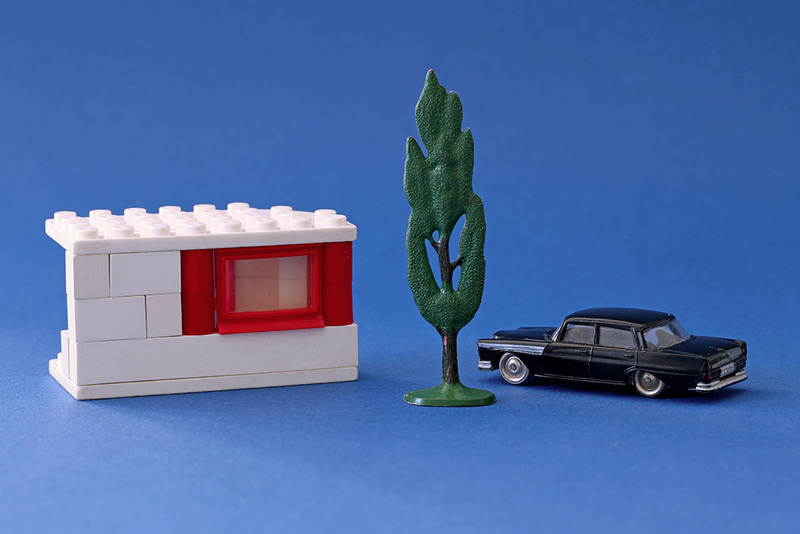 Today I took a little crack at it… I have discussed online LEGO repositories before. One source, sorted by year, for early LEGO building instructions is Worldbricks. LEGO Town Plan really got going in 1958 and this is reflected in the Worldbricks database as well, with plentiful instructions for that year. The house I decided to build is a small one, just to keep things simple. I’m sure I would have parts for something more elaborate, but time has taken its toll on my 1960s collection and with all the washing and wiping, it can be a bit of a chore… Those parts are, after all, 50 years old. The house is literally small, the 213 Small House Left (there was also a reversed 212 Small House Right). Most (if not all) of the parts came from my father’s old 1960s LEGO collection, as even where a part is identical to newer ones, you can tell the difference from the stud font. Uniquely Town Plan era parts in this set are the door, the rear window and the curved parts, which are unlike today’s curved LEGO. The 1×8 and 1×2 bricks look mostly the same as today, but are without internal tubing and thus clutch pretty badly, especially the 1×2 bricks clutch bad together. Only the 1×1 bricks look like modern ones, although the material was different in the very early days. Generally the old plates clutch a lot better than the old bricks. The tubeless bricks clutch well to the plates too, but many of them clutch quite poorly to each other. In fact, the otherwise poorly fitting 1×2 bricks fit so tightly on the plates that I had to use a 630 Brick Separator to get them out, but when they are fit together I could separate them by simply blowing air (!) from my mouth – true story. Obviously it is hard to tell how much this change is attributable to wear and tear, but memories and Internet reading does confirm initial LEGO designs didn’t clutch as well as today. The fact that the plates clutch almost too well is telling too, TLG was still trying to find the balance. The worst clutcher of them all is the 1×1 round brick, especially when clutching them together, as they seem to have too small studs on top – in the photograph above compare old round bricks in red to the one modern round brick in blue. Those old round bricks should be blue for this set too, by the way, but I don’t think I have any. I have Photoshopped the round bricks blue in the first photograph, but in reality I built them in red as can be seen below in the unaltered images. All in all, there are 21 parts to the set (Peeron has a list for the reverse version, which differs only in plates). 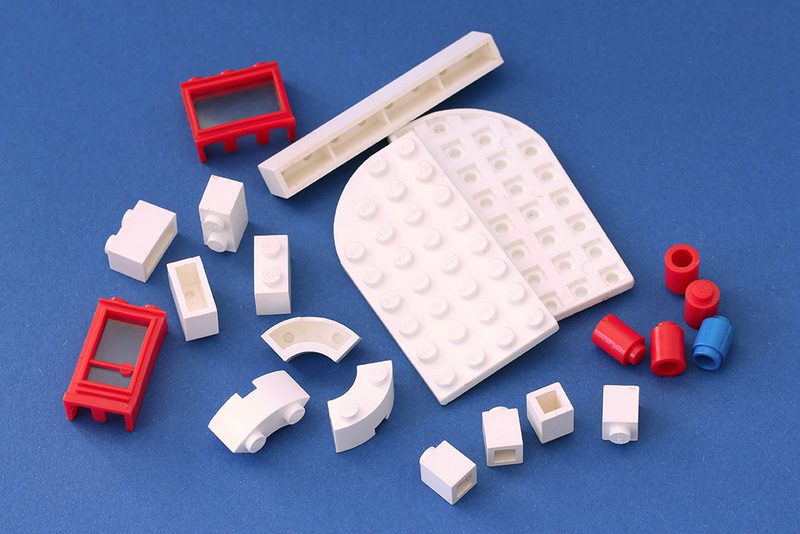 The white, red, blue color scheme was quite typical for LEGO Town Plan. One final note on the parts, Peeron mentions the plates were “probably waffle bottom style”. I was able to locate both plates in one kind of “waffle style” for this build too, so all in all, it is pretty authentic. 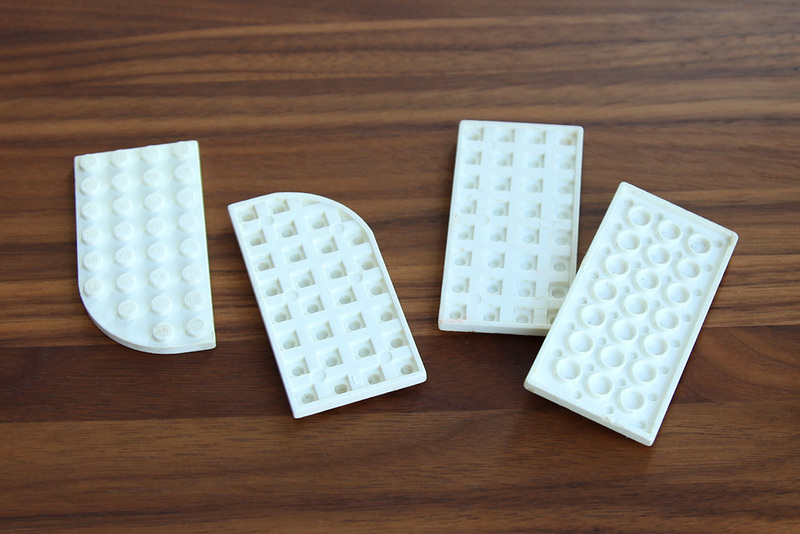 I inherited 1960s Town Plan plates both in waffle and modern locking style (there was also another waffle style in early LEGO, without the small round holes inside the squares). I added a LEGO Town Plan car and a LEGO Town Plan tree to the photographs, also from my father’s old collection, just for kicks. I am not trying anything more elaborate for now, but this was a fun little build. It is interesting to note how many small details in the construction of the pieces were different back then (see a past story for some more notes). 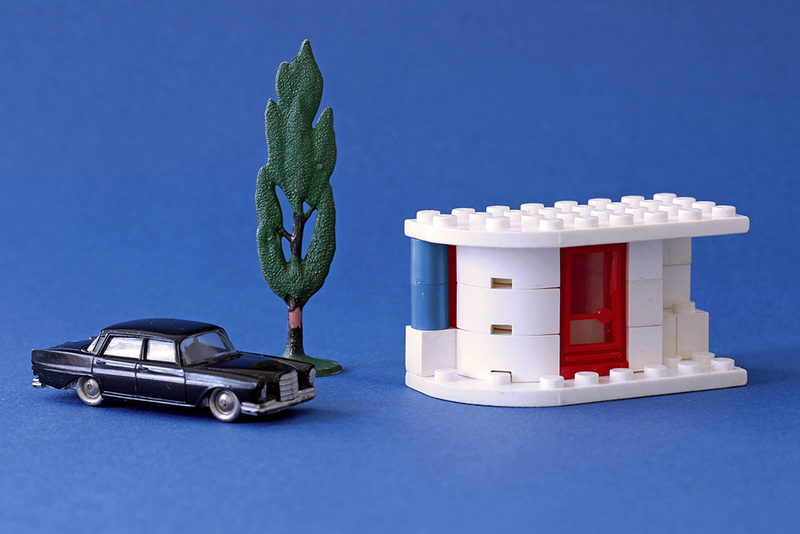 Unlike the 1970s and 1980s LEGO that is pretty much the same as you can buy from a shop today, these early pieces and designs are a little more eccentric, a little more vulnerable, a little less perfect, but all the more charming for it. Well, at least until you pull out the roof and the whole thing literally falls apart. The house is held together solely by the plates, the door/window and the 1×8 brick… especially all the 2-3 wide bricks and the round bricks might as well be studless, that’s how useless they are. I wonder how many of these bricks were manufactured in the old LEGO factory barn in Finland. Anyway, if I decide to return to these old bricks one day, here’s a starting point! P.S. 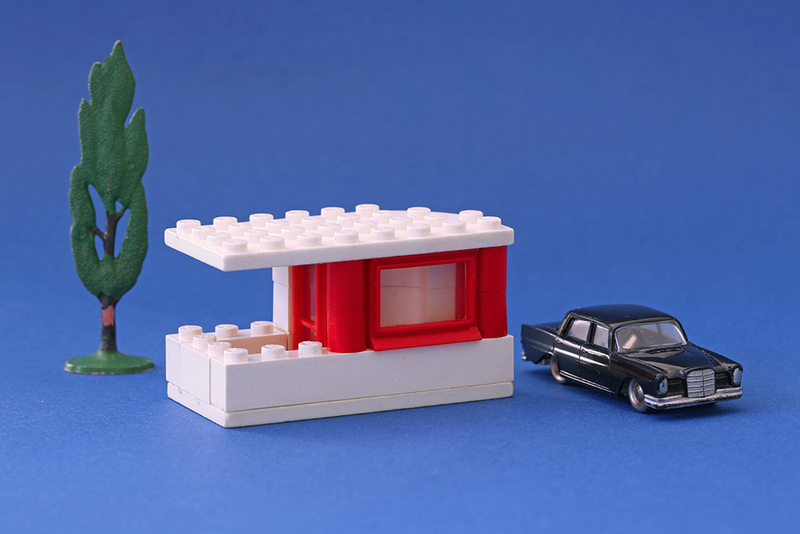 In case you missed it, check out my earlier story on 1960s LEGO battery boxes and lights. Wonderful to hear that my writing inspired you to experience some vintage LEGO.